I'm trying to start a stream on Wowza programmaticaly by feeding the stream myself with packets comming from GStreamer. it enables you to publish a stream on Wowza with Java Code by feeding the stream with byte (packets). What I'm trying to do is to read a mkv file on disk with gstreamer and send packets to Wowza using this API. For information my video and audio packets are in h264 and aac codecs. it is 2 format that Wowza knows to read. I Think, maybe the packets coming from GStreamer can't be sent to Wowza directly without some king of transformation or adaptation. respecting this format or if I have to do something myself with gstreamer packets before giving it to Wowza. 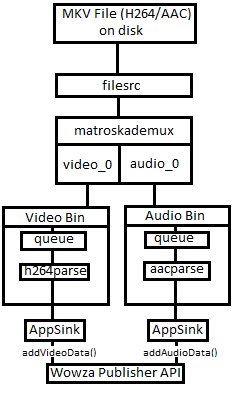 I've tryed with and without h264parse & aacparse and it is the same result. be published first. Here is the basic code to fill in the codec config data. Note: H.264 codec config data is the same as the AVCc packet in a QuickTime container. Do you know what is the problem in my code and what do I have to do to make this work ? As long as you've got the right data format for each track then it should just work however, in your example, there may be a couple of bits missing. An AMFPacket should contain the raw video frame or audio packet data after it's been unwrapped from any transport packet. As long as you're pulling the raw data out of the file then you should be able to insert it into the packets. H.264 and AAC need a codec config packet for each track at the beginning of the stream to tell the decoder how to configure itself. The data should be in your file and is probably the first packets that GStreamer sends out for each track. You need to make sure these get inserted into your publisher stream at TC 0. By default when you create an AMFPacket, it doesn't have a timecode set so you will need to keep track of the timecodes and set them yourself or at least pass the correct value into the publisher when inserting the data. Currently, you're probably setting TC 0 for every packet.